I’ve written of my Jazz Fusion experience during the ’70s of late. To an extent, that’s ignored other genres explored during that same decade. I’ll leave it alone for a while, but not before I cover the boundary line reached with this music. Jazz Fusion was quite experimental, going off on “… lengthy group improvisations, often using wind and brass and displaying a high level of instrumental technique“, as Wikipedia cited. The mixture of jazz improvisation along with the power and rhythms of rock could be intoxicating, and a little maddening. At least, for this listener. It was during the ’60s where the completely separate worlds blended into this hybrid of style and sound (and sometimes sights). Ignored by purists, it still developed quite a following. Even the legendary Miles Davis augmented his already large litany of jazz tracks by enveloping himself in it. 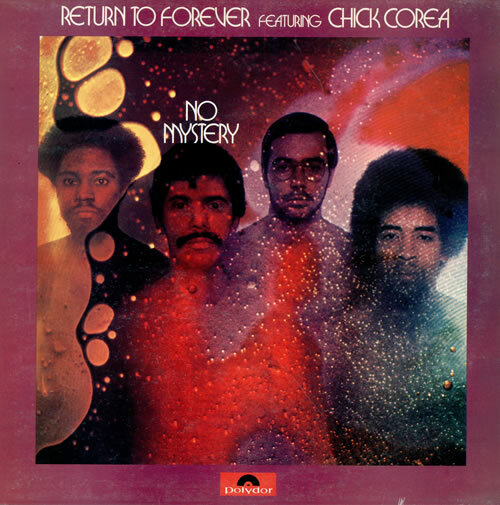 Still, none were more responsible for the reaches jazz rock attained than was the group Return to Forever. Founded and led by pianist Chick Corea, the group cycled through a number of musicians through its ranks over the years and albums. But if you ask old-timers like myself, they were at their pinnacle when drummer Lenny White, bassist Stanley Clarke, and the then 19-year-old guitar prodigy Al Di Meola (whose musical drive was spurred by listening to The Beatles, btw) coalesced with Chick to be Return to Forever. It was here where I discovered my edge with regard to Jazz Fusion, too. What I enjoyed about it and where my ‘cutting-edge’ ceiling was reached. I’d fall back to more melodic tracks after tuning to this well-known Fusion group. Not a criticism of them, but where I was as an enthusiast with the new sound bouncing off my ear drums back then. Inadvertently, locating where my tastes and comfort zone really was. Dancing around it. Going over on occasion, but always returning. His superb little riff in the six-minute number retained a distinctly wistful quality. Expressing an unforeseen, near remorseful facet floating in between Clarke’s bass and White’s beat. Imbued by the guitarist’s work of the strings as if it was another instrument, I replayed the track endlessly and still discovered things hidden within. Even years later, something fresh with each revisit. Listening to the track somehow reached down to tear at my heart, even as the improvisation and syncopation registered with my ears and head. Still don’t understand it. But as the decade closed, this Fusion instrumental, and a handful of others, came with me when others didn’t.